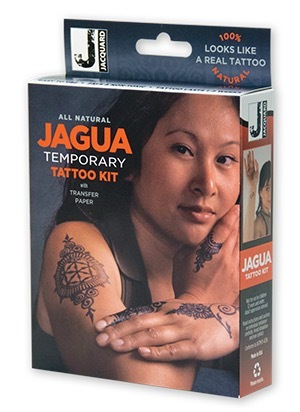 Fruit-based and 100% natural, Jagua produces bluish-black tattoos that last 1-2 weeks and look real. Test drive your tattoo ideas or fool your friends—it's only temporary! The jagua fruit (Genipa americana) has been used for body adornment by indigenous peoples of the Amazon for millennia. This is the only shelf-stable form of jagua ever made available. It is incredibly simple: once applied, the color darkens to its final shade over 24 hours and lasts until the skin exfoliates. Apply to any part of the body to express yourself. All the necessary tools are included. Use the provided Transfer Paper for easy tracing of custom designs, or freehand draw directly onto the skin.